“Data is the new Oil”, said SAP’s CEO Bill McDermott at SAPPHIRE 2017. As the market leader in enterprise application software, SAP is at the center of today’s business and technology revolution. NetApp, being an SAP Global Technology Partner for more than 15 years, is the data authority in the hybrid cloud. NetApp and SAP work together to deliver uninterrupted real-time data access, multitenancy, and accelerated project ramp-up to propel our customers’ business forward. A Data Fabric powered by NetApp technology optimizes the value of SAP data and helps companies worldwide access enterprise applications and data where they fit best—across on-premises, hosted, and public-cloud environments. But the world is changing. Digital transformation with internet of things, machine learning and artificial intelligence will change the way business are run, today and tomorrow. Do you want to learn how NetApp helps customers transform their SAP environments to take advantage of hybrid cloud capabilities? Do you want to learn how NetApp’s solutions and products can help you to accelerate projects, to automate processes and save time on your journey to the cloud? Do you want to learn how NetApp can help you to create a comprehensive end-to-end data management strategy? 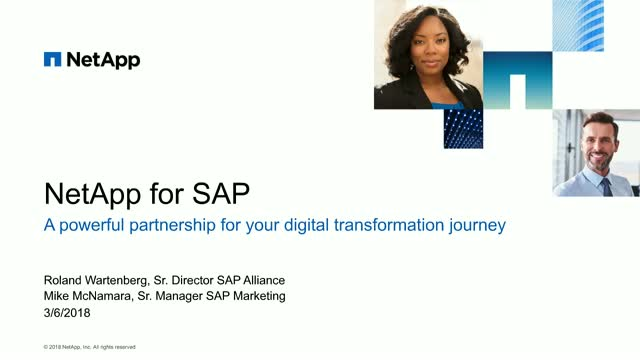 In this webcast we answer not only these questions, we also will show how customers have taken advantage of today’s NetApp SAP Software Solutions to make their businesses ready for tomorrow’s challenges in the world of digital transformation.